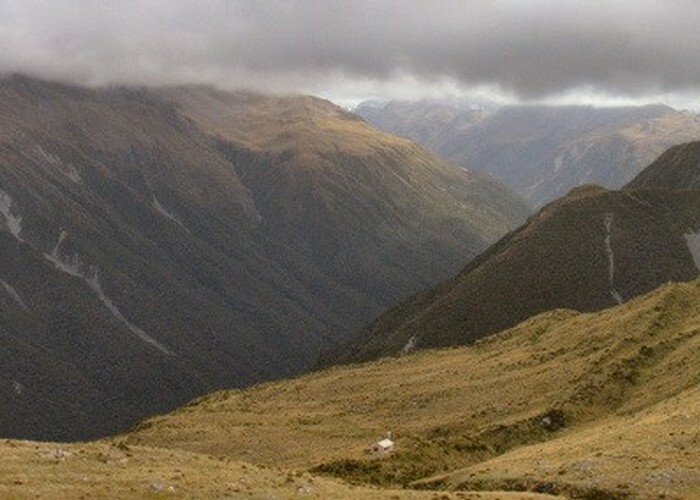 A brief climb up to Carroll Hut on the tops at the northern edge of Arthur's Pass National Park. Magnificent 360° views. From the car park, a clear track passes a junction with the track to Hunts Hut then begins a steep climb through forest. The climb eases after 1hr and enters low scrub after 2. Finally, the track leads onto a handsome alpine herbfield plateau. 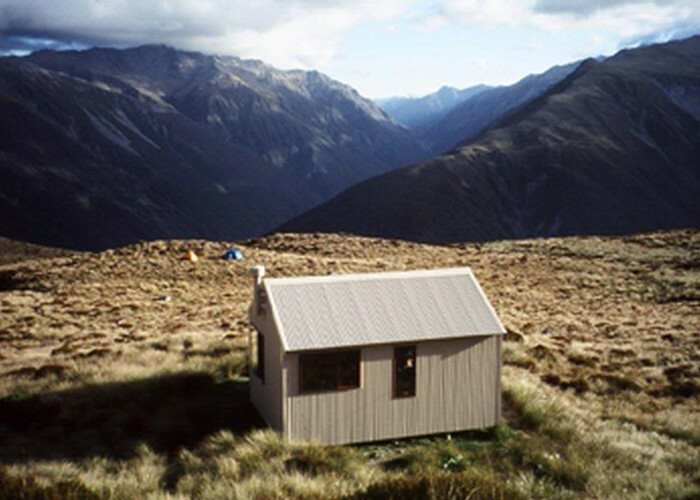 Carroll Hut is situated near the top of the plateau. Water is available from the nearby creek. Carroll Hut • By Matthew. There is a lot of space to explore up here. A track leads behind the hut onto the Kelly Saddle (1165m) which is occupied by a few tarns. A poled route turns sharply right from this track and leads quickly up onto Kelly's Hill itself. The highest point (1408m) is occupied by a TV transmitter, while the trig is located a little further along at 1394m. The numerous small fault creases in the landscape here line up perfectly with the major Hope Fault running along the Taramakau Valley. Another route leads from the saddle around the north face of the Kelly Range and down to Seven Mile Creek and the Taipo valley tracks. Finally, a traverse of the range is easy walking although the descent into Hunts Saddle at the southwestern end is a challenging push through scrub. Added 23 April 2003 by MatthewMatthew. 4 revisions, most recently 21 November 2015 by glennjglennj. 391 views in the past year (33 per month).